As soon as the colder weather hits, I am all about the comfort food. Soup and bread are my go to's. I usually have soup on the menu at least once a week. I love to make a big ol' pot that makes enough for left overs. Soup almost always gets better the next day, so it works our perfectly. There is nothing like coming in from the cold outdoors to a nice big bowl of hot soup. With bread to dip, of course. 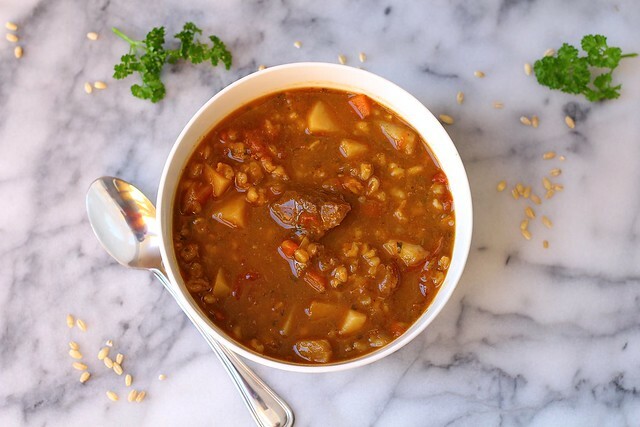 When we pre-order our meat in the Spring from a local organic farm, I always make sure to order plenty of stew meat so I can make the beloved braised beef, and this soup. They are major favorites in our household! This soup is hearty, filling and delicious. The stew meat becomes irresistible melt-in-your-mouth tasting. Then there is a delicious mixture of fresh vegetables, and the healthy addition of barley. The perfect soup in my book! This is great to make an extra large batch to feed a crowd, or to throw in your freezer for those nights you don't feel like cooking. Heat the oil in a large stock pot over medium-high heat until shimmering. Add the stew meat and cook for 3 minutes. Stir in the onions and turn the heat down to medium-low. Cook, stirring occasionally, until the onions are just beginning to caramelize, adding more oil if needed. Stir in the garlic until fragrant, about 30 seconds. Stir in everything except the tomatoes. Stir well, making sure to scrape up any burnt pieces on the bottom. Increase the heat and bring the soup to a boil. Then, turn the heat to low, cover the pot, and simmer for 2 hours, stirring occasionally. If the soup becomes too thick, add more water. Taste the soup after 2 hours, adjust seasonings as needed. Stir in the tomatoes and simmer for another hour. Remove the bay leaf and dish into individual bowls. Garnish with freshly chopped parsley, if desired.